Okay ... this may not be much of a recipe but more of an assembly, as the only thing needing to be cooked is the bacon. This was inspired by a starter I ate at a restaurant once, I have tried to recreate it and thought you may like to too! Dry fry the bacon in a non stick pan until super crispy and then blot it with paper towel. 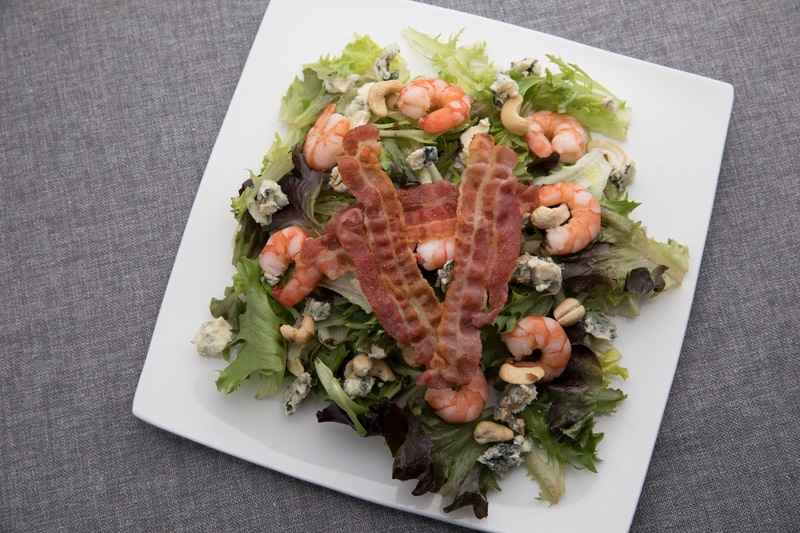 Put half the bag of mixed leaves on a plate and add half a pack of prawns scattered on top. Crumble over a quarter of the pack of Saint Agur. Add a handful of cashews and lightly drizzle with olive oil and balsamic vinegar. Top with three pieces of crispy bacon on top and voila! It's complete! The meal tastes wonderfully luxurious with all the complex flavours combined and doesn't break the bank! Let me know if you try it and what you think!